Future Horizons will be hosting the Oklahoma City Autism Conference with Dr. Temple Grandin - February 21, 2019. 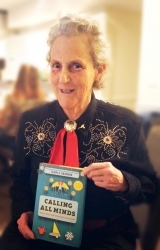 Oklahoma City, OK, January 03, 2019 --(PR.com)-- Join Dr. Temple Grandin and two great speakers for this special event in Oklahoma City, OK on February 21, 2019. This conference will include a special appearance via Skype from Eustacia Cutler, and best selling author of Behavior Solutions in the Classroom, Beth Aune will speak in person. Eustacia Cutler, the mother of Temple Grandin, will offer her view of autism through personal experience. Her daughter is now one of the most accomplished spokespersons on autism and animal behavior worldwide. Eustacia will give her presentation via Skype. Beth Aune, OTR/L, has developed and presented numerous workshops for parents and educators that focus on the care and treatment of children with disabilities. She most recently authored Behavior Solutions for the Home & Community.